Thailand makes you feel like you are in the middle of some Hollywood movie scene, where you are surrounded by some of the most buzzing places of Thailand such as Floating markets, golden-roofed Buddha and other amazing temples, water rides in the clean sandy beaches, roaring wildlife, adventurous jungle trekking, ancient ruins, and mesmerizing zoos. Khao Kheow Open Zoo is the best destination to visit when you plan visit for Family Adventures Places in Thailand. There are many exciting places in Thailand however when you are traveling with your beloved family, you ought to be in the place that has fine combination of fun, excitement and relaxingly adventurous. Flight of the gibbons is the world’s largest Zipline adventures. It is spread across sprawling long three kilometers of canopy wires. This amazing jungle canopy has mesmerizing view from the top. Scene from the distance has a spectacular sights of birds, animals and lush green trees. 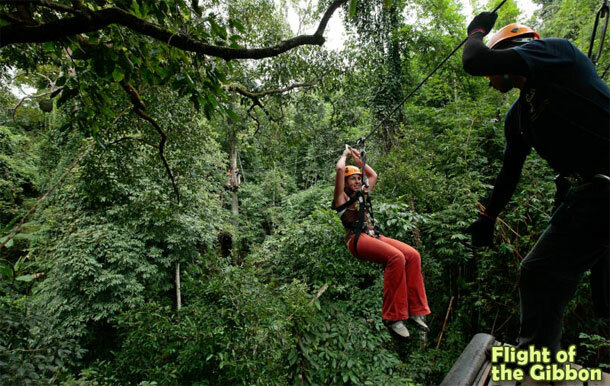 The Sky rangers of Zipline adventure from Khao Kheow Open Zoo shares vital information and suggest users not wear expensive ornaments but comfortable cloths and durable shoes. Breakfast with Suriya is loved by many because of the fun and exciting elements. Suriya is a friendly orangutan who shares his spectacular skills to entertain the guests while swinging across from the tree branches during the breakfast. Suriya comes down from high trees while displaying his acrobatic moves to join you for mouth watering breakfast.